About 9,000 years ago, rising seas isolated this archipelago of mangrove-fringed islands off Panama’s Caribbean coast. STRI’s state-of-the art station in Panama’s Bocas Del Toro province draws scientists from around the world to study the species-rich marine and terrestrial habitats. The station hosts much of the institute’s scientific diving activities, allowing access to diverse coral reef and seagrass habitats. 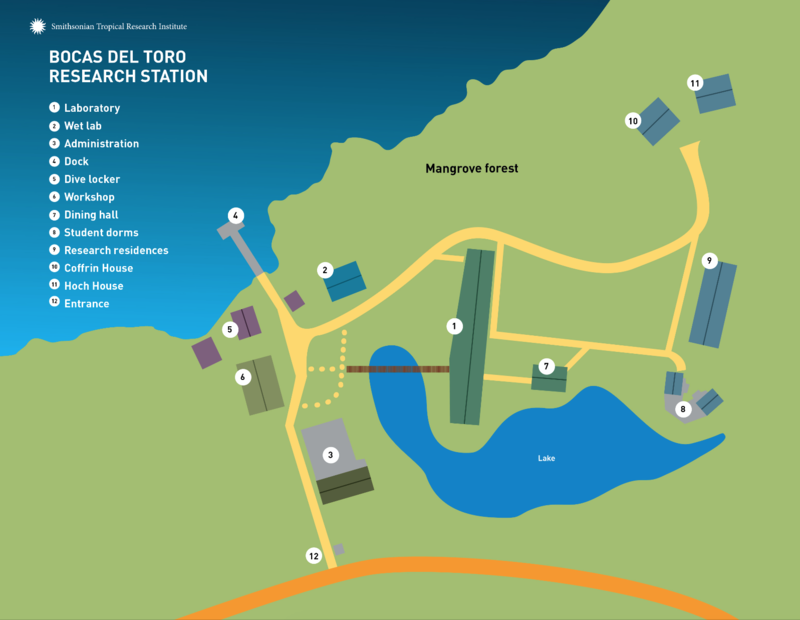 The station is also conveniently close to montane forests, lowland rainforests mangroves, and unique peat swamp forests. With 20 million years of geological history, islands separated from the mainland due to sea level rise, and a rich pre-Columbian and modern anthropological history, Bocas Del Toro is a remarkable natural laboratory to study evolution, climate change and human impact on Caribbean ecosystems. Marine research focuses on mangroves, seagrasses and coral reefs; the taxonomy of invertebrates; and the impact of human activity on coastal ecosystems and species like bottlenose dolphins. Terrestrial work includes the study of evolution of multiple colorful morphs of a poison-dart frog and the natural defenses of cacao trees against pathogens. Smithsonian scientists first surveyed the mammal fauna of Panama's Bocas del Toro province in the 1970s. During the 1980s the Smithsonian's Panama Paleontology Project studied the geological history of the region to better understand the rise of the Isthmus of Panama. A permanent Smithsonian presence began with a land purchase in 1998. The state-of-the-art lab building was inaugurated in 2003 followed by a seawater system in 2004. Houses, kitchen and dorms have been added as the station gained recognition and popularity as a leading Caribbean research platform. Bocas station's staff helps scientists with their research projects; keeps the dive locker, boats, grounds and labs in top shape; attend public visitors and engage in off-station community outreach, often at elementary schools. 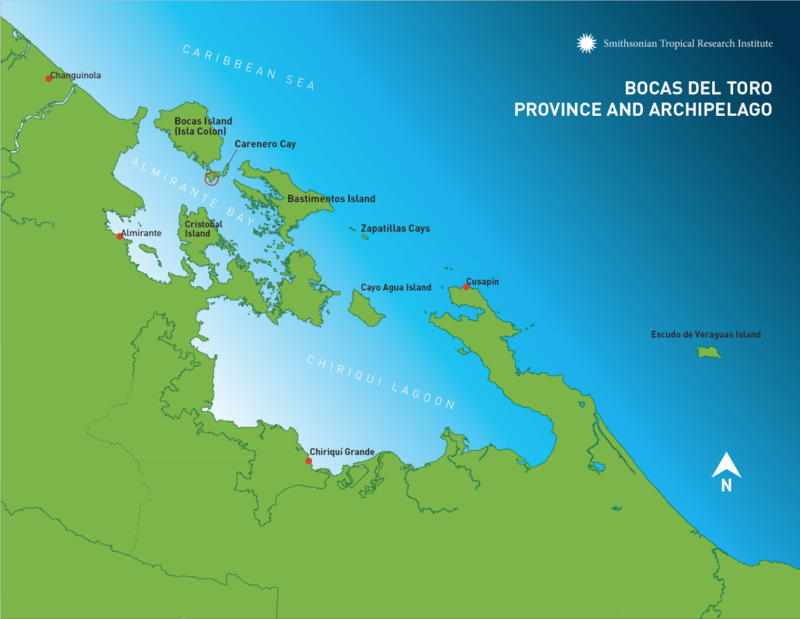 The Bocas station has virtually all the resources a marine biologist or terrestrial ecologist could need for a successful tropical field season: air-conditioned laboratories, modern lab equipment, a seawater system, a dive locker, a dock and boats, and comfortable living quarters. Meteorological and oceanographic data has been systematically collected at the station since the early 2000s. In 2015, STRI and the MarineGEO program installed a multi-sensor sonde on a platform just off STRI’s dock, which records 16 different parameters every five minutes. The station also hosts COCONet, Ocean Cube and WMO ozone monitoring installations. The station has well-equipped, air-conditioned labs with high-speed internet. Researchers can use the station’s outdoor aquaria, seawater system and an air-conditioned wet lab. The busiest of STRI’s scientific diving sites is Bocas Del Toro. The station has a fully equipped dive locker with a cascade compressor system and enough tanks for large groups (though visiting divers will need to bring their own personal gear). Dive buddies and boat drivers can be hired by the day to assist researchers with their work. Our scientific diving program is affiliated with the American Academy of Underwater Sciences (AAUS). The station has small research vessels ranging in length from 15 feet to 25 feet. Boats are used for accessing scientific diving sites, studying mangroves and accessing research sites surrounding islands and peninsulas. There is usually high demand for boats and boat captains so it is essential to plan in advance if your research project requires boats. Training in Tropical Taxonomy (TTT) courses are a signature program at the Bocas station. A major impediment to documentation and conservation of global biodiversity is the shortage of scientists trained to find, describe and name organisms. The TTT program, founded by station director Rachel Collin, is unique in addressing this issue by focusing on hands-on training in the field to train future experts on the taxonomy of under-studied organisms. The station has two shared dorms that accommodate up to 32 people. There are two large kitchens and dining halls, one for each dorm. The Hoch and Cofrin houses have fully equipped kitchens, ample living rooms, furniture and two air-conditioned rooms with two double beds each. Catering staff can be hired for large groups. Food can be purchased in town. Some rooms accommodate 1-2 people. The station has two manual transmission 4x4 trucks available at most research facilities. Some labs have their own vehicles as well. These vehicles are for authorizes research activities and need to be booked in advance. Drivers need valid licenses, a U.S. government license (issued at STRI), and experience driving manual transmission vehicles in off-road conditions. Bocas Del Toro is the westernmost province of Panama. Colón Island is one of the largest islands in Almirante Bay. 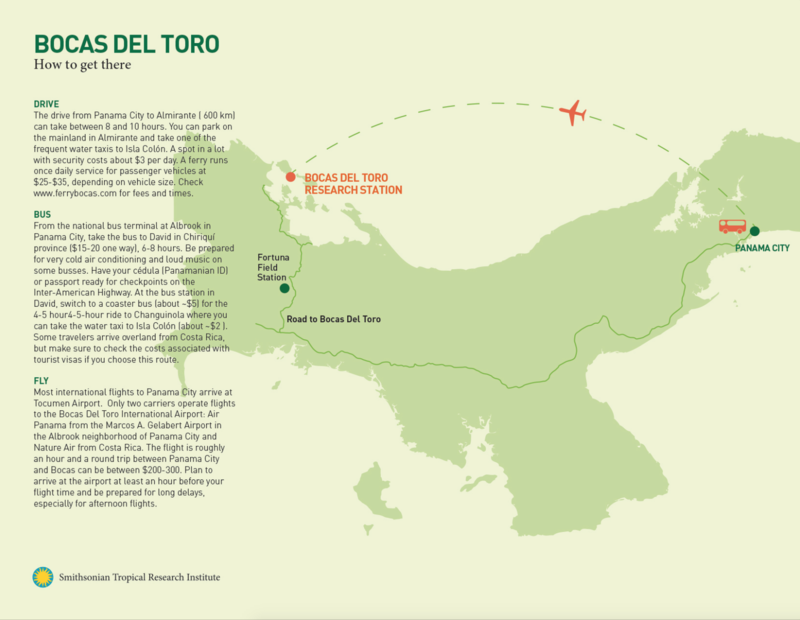 The research station is located on a tiny isthmus that connects the large northern portion of Colón Island to the town of Bocas Del Toro, often referred to as Bocas Town. The station is a few minutes by taxi (less than $1) from town. From the airport to the station, transportation in taxis or collective vans costs $2.